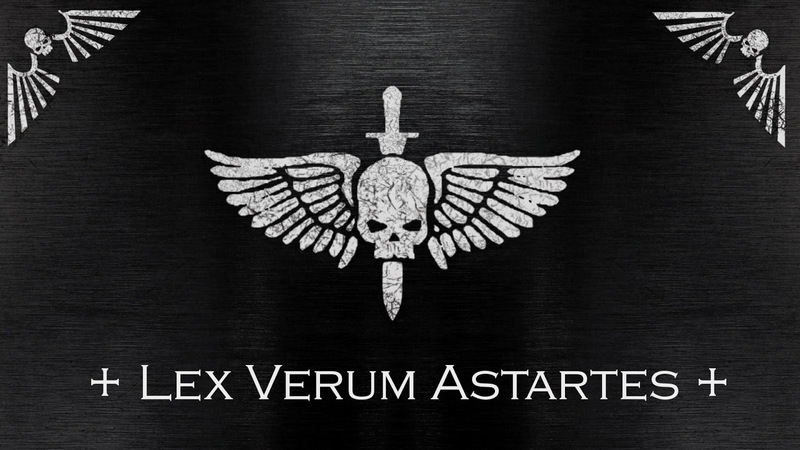 Hey everyone, and welcome back to Rites of Battle, and to the first official installment of my newest series, Lex Verum Astartes. For those of you who haven't brushed up on your Latin, or are too lazy to hit up the Google Translation... this title roughly translates to "The True Warriors Project." The goal of this series is to stop wishing that Space Marines were more like their fluff, and try my hand at making it a reality. Rules for using the codex, such as Army Special Rules, Unique Relics, Warlord Table, Unique Allies Matrix, etc. In order to make a Space Marine adhere more to their existing fluff, it is important to make them feel durable and powerful on the table top. 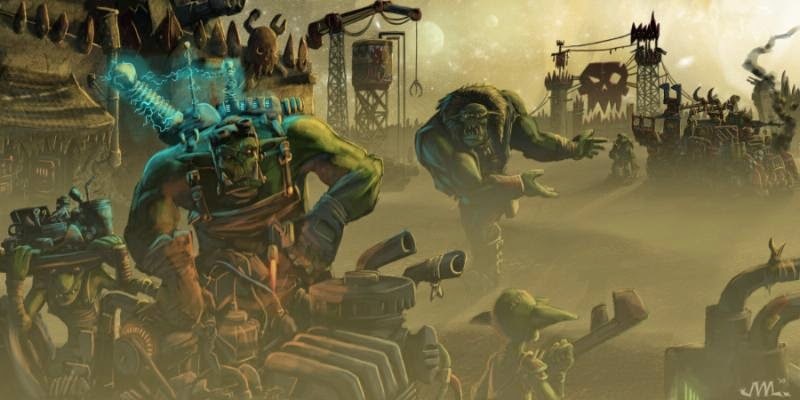 The rules for these models will be outlandishly more powerful than the current Space Marines, with heightened stats, rules for equipment, and of course adjusted points to compensate for these changes. The end result should allow for an 1,850 point army to contain somewhere around ten Space Marine models along with one or two vehicles. This should provide armies with a challenging opponent, while allowing the army itself to feel highly elite. Lets face it, Space Marine models as they are now are not the correct size. I wrote an article long ago discussing that very issue. I feel it's now high time I stopped pointing it out as a problem and do what I can to address it. 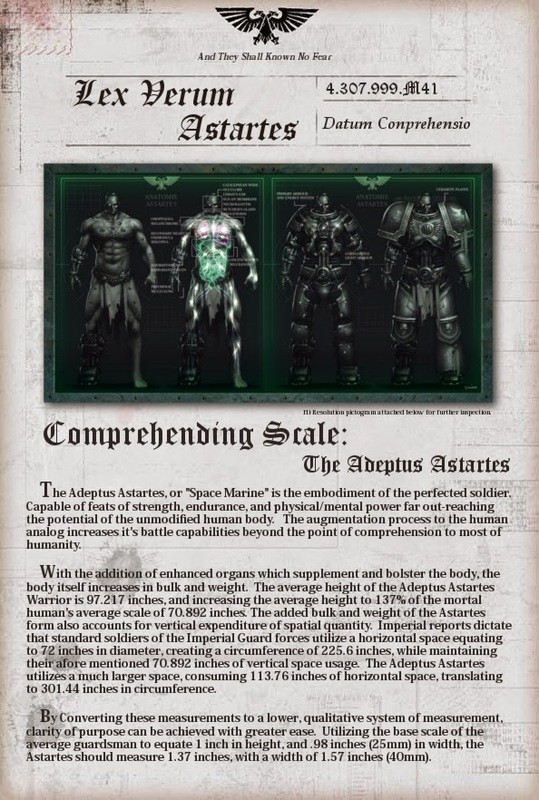 As part of this project, I intend to create Adeptus Astartes models which stand at the appropriate scale relative to their human (Imperial Guard) counterparts. I want to release these models alongside their respective dataslate entries as they are completed. Once finished, I intent to have a slew of tru-scale Space Marine models at my disposal which are worthy of their unique and powerful rules. I have been reading up and working on understanding the scale of Space Marines for some time now, and so I wanted to end with my first dataslate for the project. These entries will contain pictures of completed conversions, rules for units, or lore behind the process. I am working to mesh colorful character dialog with detailed information covering what I have learned. This first entry will cover the basics of understanding the height and width conversions necessary for creating Verum Astartes models. It shall be a long-lasting labor of love, and I am excited to get it underway.